Not surprisingly, I know a few chefs. Most in NYC. One I met almost 20 years ago when we began working together as culinary instructors. We became instant friends and despite the distance between us, we have remained close. Rian has a lovable Southern background with a great New York attitude. He is quick, witty, kind and one hell of a cook. If asked, he would say he “prefers” pastry, but he is amply skilled in cooking both sweet and savory foods. He is also (like many great chefs) self-taught. A dinner at Rian’s home is always an incredible treat filled with surprises. Often a multi-course meal with 6-8 dishes and perfectly matched wines, dinner at Rian’s is one of the things I miss most about New York. As he is a talented chef, I was humbled when Rian came to my blog to look for a particular recipe: one for beet hummus. Maybe you’ve had some, or maybe you’ve seen it on a menu recently. Beet hummus it is considered a “hot dish” right now. So when Rian e-mailed, I developed this beet humus recipe for him. I hope that he likes it as much as I do. I love beets. Straight up roasted with a drizzle of olive oil, I think they are like candy–but better. On menus, I will order almost any dish with the word “beet” included. Red, golden or stripped, beets are a wonderful root vegetable that can be used in a wide range of foods from smoothies to layer cakes. Beets are also good for you. For instance, they contain a lot of nutrients in a low-calorie package; and they contain dietary nitrates that get converted to the “miracle molecule” Nitric Oxide, which is why they are known to lower blood pressure. Hummus is traditionally a simple spread made of chickpeas, tahini, lemon juice and garlic. It has become increasingly popular in the last twenty years. 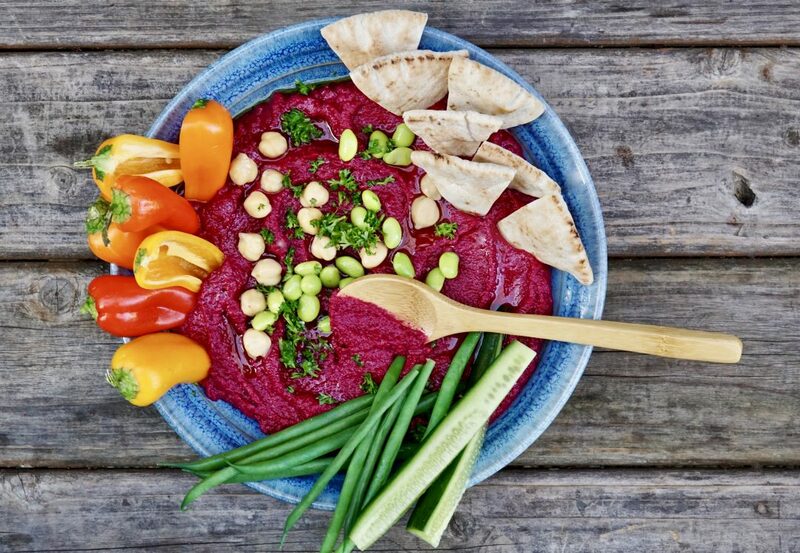 Considered almost a peasant food in the Middle East, it has been credited as being “a dynamite product in America.” 20 years ago, hummus sales had not even reached $5 million; by 2016 they had reached $725 million annually. It’s estimated that 25 percent of American homes now stock humus in the fridge. Numerous variations of this classic have popped up, from red pepper to edamame (a flavor my mother-in-law lives on). 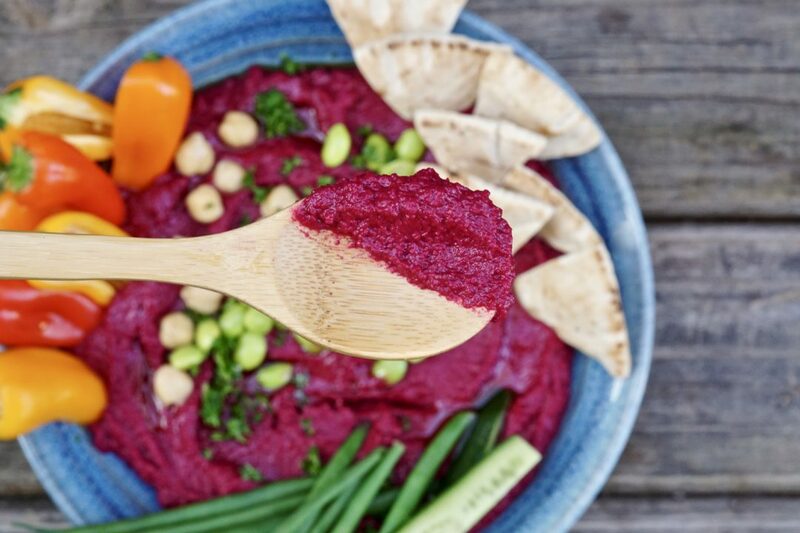 For my beet hummus recipe, I wanted the classic humus texture with the earthy beet flavor. To achieve this, I use roasted red beets as the base but also added a mixture of chickpeas and edamame. I like to oven roast my beets; although easy, it is the most time-consuming part of this dip. Once roasted, everything gets blended until you have a vibrant, spreadable dip. I serve mine with pita and vegetables for variety; but this dip would also work well with just about anything. Although I am yet to get Rian’s stamp of approval, I did get a major thumbs up from my husband, who is not normally a huge beet fan. In fact, he liked it so much he ate it for breakfast; but if you know my husband, that’s not all that surprising. Step 2 Cut off the beet tops. Scrub and dry the beets then wrap them loosely in aluminum foil. Place the beets on a baking sheet and roast for about 50-60 minutes, depending on their size. Check the beets after 40 minutes by piercing with a small paring knife. Beets are done when a knife slides easily to the center. Open the foil and allow the beets to cool. Step 3 When cool enough to handle, peel the beets. Using a paring knife or your hands, gently peel away the skin and discard. Set aside. 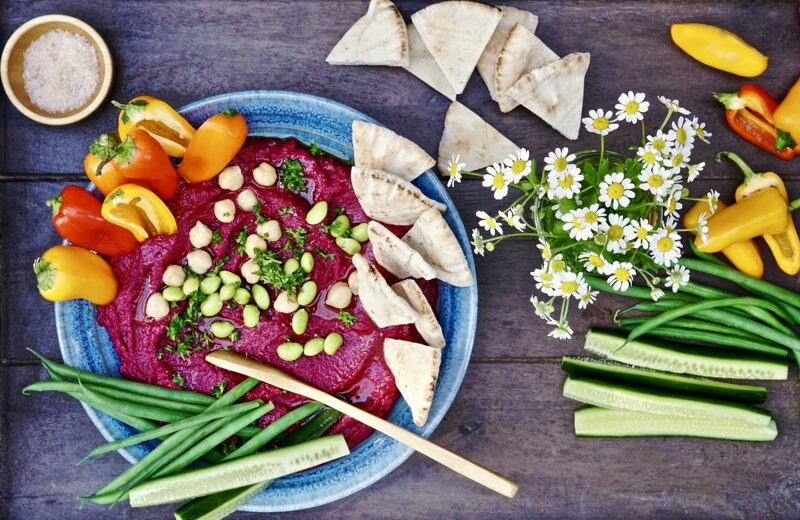 Step 4 Using a food processor, such as a Cusinart fitted with a metal blade attachment, add the cooled, roasted beets, chickpeas, edamame, tahini, garlic, lemon zest, lemon juice and salt. Puree on high for 1 minute or until smooth. Pulse in the olive oil to blend. Step 5 Serve hummus dip chilled. I am a heavy beet, hummus and anything-sesame user. 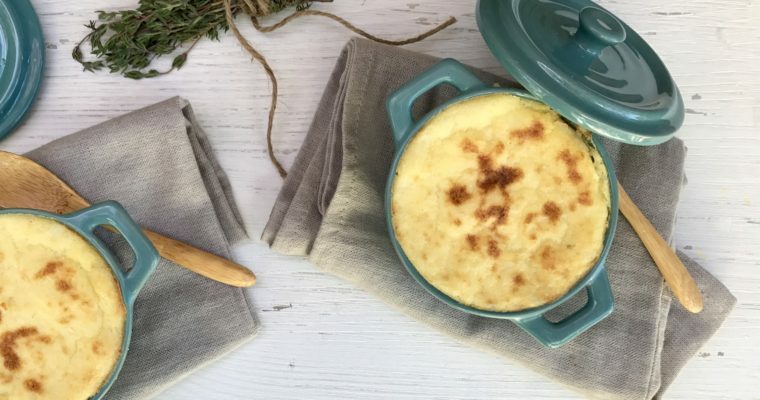 I just made your recipe and, wow, it is delicious! I so enjoy simmer+sauce; your background stories and recipes with photos always inspire me to cook (and drink) more. Thanks for the kind words Roz, so glad you made this. Keep cooking!